This rig is an excellent illustration of how guns can make up for lack of number or physical strength. A hundred-pound girl can hold off a mob of hundreds if properly armed, while even a dozen of unarmed strong men would get trampled by the same. 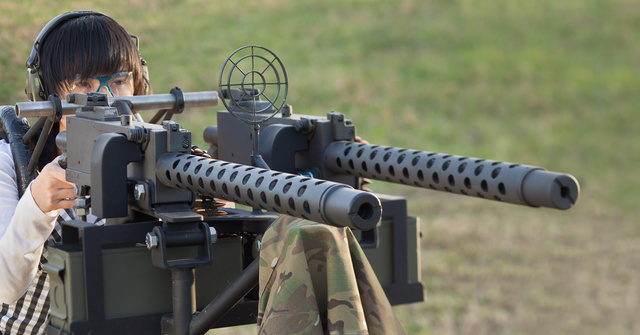 Ideally, a machine gunner would be supported by an assistant and a squad of riflemen, but with good placement and the ability to fire one gun while the other cools down or gets fresh ammo, even a single defender can have a strong effect. This entry was posted in weapon and tagged 30-06, 308Win, girl, M1919, machine gun, small, tripod. Bookmark the permalink. I just can’t think of any reason why every home should not be equipped with one of these in the attic. Mr Volk, thanks very much for your blog & pics. You & they are much appreciated. Looks like one .308 and one .30 or 8mm. Diversity! One is .308, the other 30-06. How did you tell? Larger booster opening on the .30, which also works for 8mm. I have both, remember. I knew the only way anyone would tell a difference was from the front. Makes little difference when all you see is flashes though! You can tell the difference from the left side, too…different length front cartridge stops.